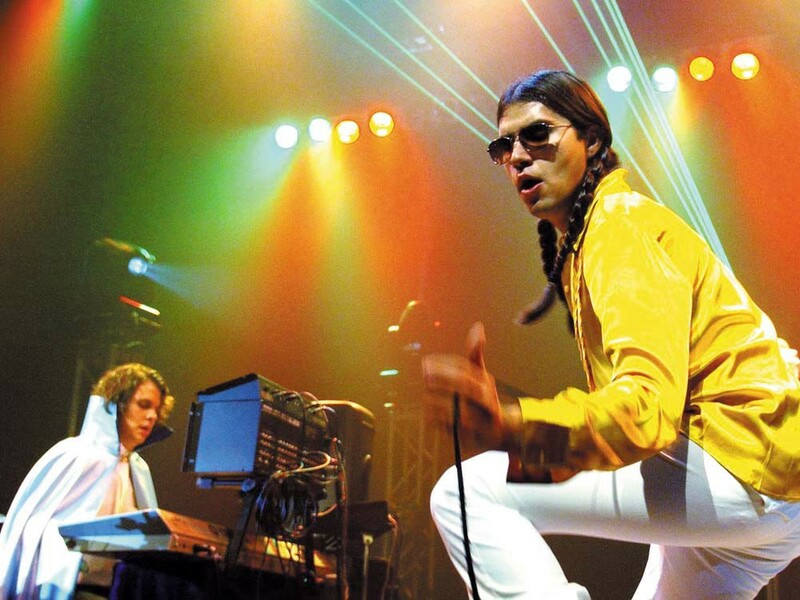 Ghostland Observatory is a robotic rug-cutting dance machine … from Texas? It's a firestorm of lasers, men in capes and an androgynous-looking Pocahontas. And that’s just onstage. Offstage, their devoted followers shimmy, shake and groove to the electronic dance beats and bizarre sideshow that is Ghostland Observatory. The Texas duo — Aaron Behrens and Thomas Turner — have created an electro/punk sound that fuses electronica, glam-metal guitar, drums and ballads into one big ball of energy. Their four-album discography plays like a continuous dance party … which is kinda the point. It’s not usual to find robots, astronauts and space zombies break-dancing at a Ghostland concert. Turner gallivants around the stage in a cape made from a Texas flag and Behrens is a pied piper for the masses. When he dances, fans follow. “You haven’t seen a show like this before,” Turner says. Here are our picks for the most danceable Ghostland tracks. You can count on hearing several of them at the show. “Silver City”: You can’t be too drunk to dance to this song. Hip-hop beats, repetitive keyboard rainbows and a helluva lot of background noise will make your stumbling and lack of rhythm seem intentional. “Club Soda”: Nine Inch Nails beats meet hair-band guitars. An absence of vocals gives it just the right feel for interpretative dance. Flutter, float and dance with imaginary ribbons and imaginary partners. “Ghetto Magnet”: This song sounds like a punk-y swarm of bees behind a drum machine. Crashing to the floor and mild head-banging is allowed, but don’t push your neighbor. “Kick Clap Speaker”: See what you come up with: Classical piano, vintage videogame vocals and electronic rave. All signs point toward eyes-closed, seizure-like behavior.